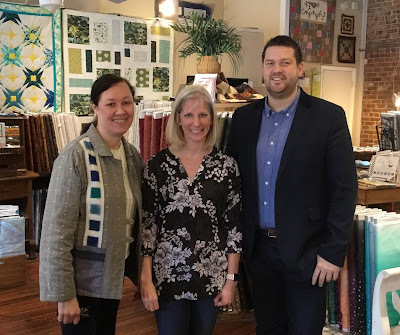 During the two-day whirlwind visit with Ben Taphouse, Director of Sales for Lewis and Irene fabrics, we visited four quilt shops in Tennessee and Georgia. 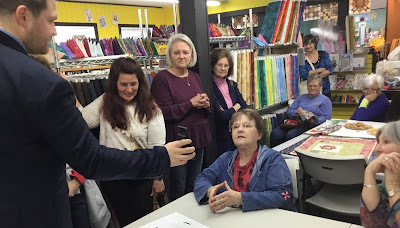 After a presentation for the Choo Choo Quilters on Monday evening (see this blog post), we had a full day on Tuesday meeting with shop owners of Chattanooga Quilts, Chattanooga Sewing Machines and More, Sew 'n So Quilt Shop and Lana's Quilts and Sew Much More. with Ben (right) and me. 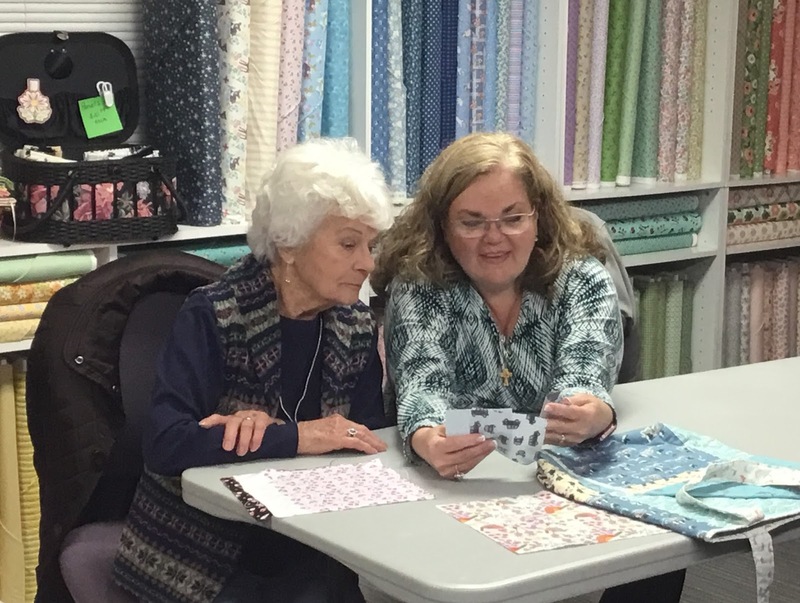 Our first stop Tuesday morning was at Chattanooga Quilts in Ooltewah. 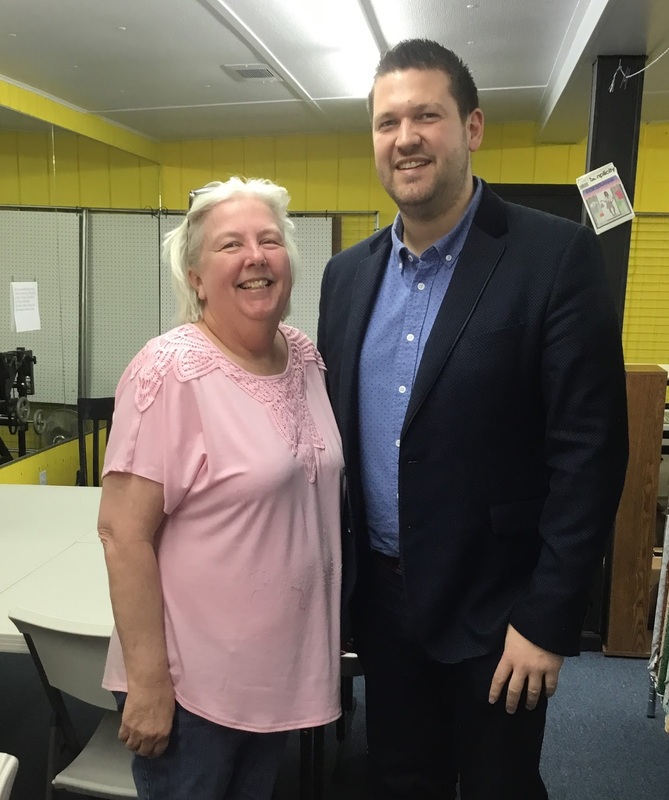 Here we are with Kim Thomas, the owner. 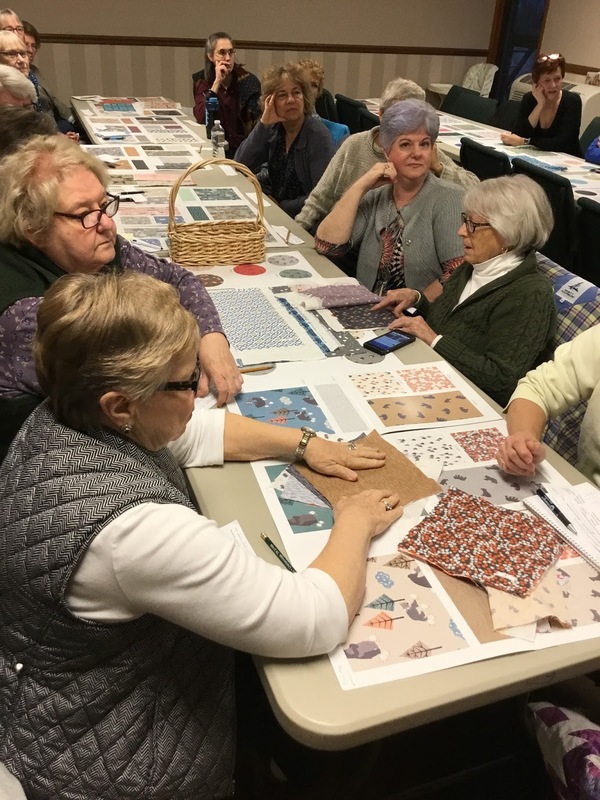 The Lewis and Irene fabrics were well received at Chattanooga Quilts, so be looking for several collections arriving in the upcoming months. You won't lack for project ideas and inspiration at Chattanooga Quilts because Kim has curated fabrics for several projects and kits will be available at her shop. The Lewis and Irene website also has loads of free patterns for downloading. Contact Kim to see what's coming in. Traveling from Chattanooga Quilts in Ooltewah, Ben and I dropped by Chattanooga Sewing Machines and More. Because of our tight schedule and the flurry of activity that was happening at this store (it was hopping! ), I didn't get a photo. But I can say that shop owners, Kyra Rhyne and Josh Flinn were smitten with the collections and have childrenswear and garment sewing projects planned for them. 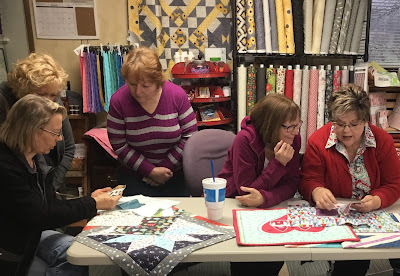 Be watching their class calendar and stop in the shop in the next months. 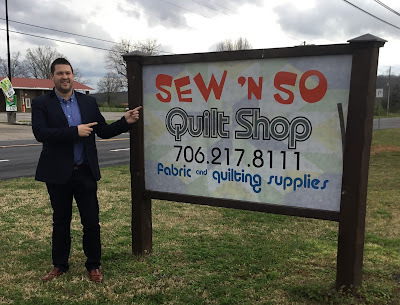 Ben outside Sew 'n So Quilt Shop in Rocky Face, GA.
On to Sew 'n So Quilt Shop in Rocky Face, GA, where we were greeted by shop owner, Anna Quarles, and a group of her customers. the glow-in-the-dark inks in the Fairy Lights collection. Ooohs and ahhhhs filled the shop during Ben's presentation of the upcoming Lewis and Irene fabric collections. Anna took copious notes based on the "Oooh/Aaah Barometer" and reactions to the lines from the attendees. As of the writing of this blog post, the full collection of Lewis and Irene's "Bee Kind" is at Sew 'n So Quilt Shop along with pre-cuts from the Spring/Summer Bumbleberries collection. Meet and Greet with Ben Taphouse at Sew 'n So Quilt Shop. Lucky winners of the door prizes were thrilled to be going home with Lewis and Irene fabric goodies. 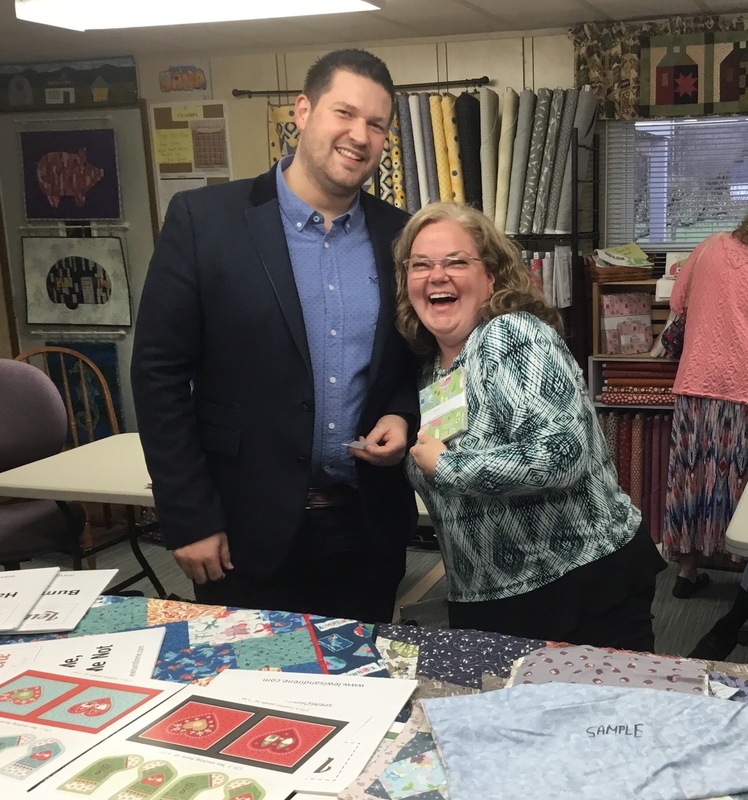 Anna Quarles, owner of Sew 'n So Quilt Shop and Ben Taphouse. The final appointment of the day was an evening Meet and Greet at Lana's Quilts and Sew Much More in Cleveland, TN, hosted by shop owner, Lana Masengill. and pass around the samples. There were lots of projects and samples on hand for people to see at the Meet and Greet. A lucky winner of Lewis and Irene charm squares. 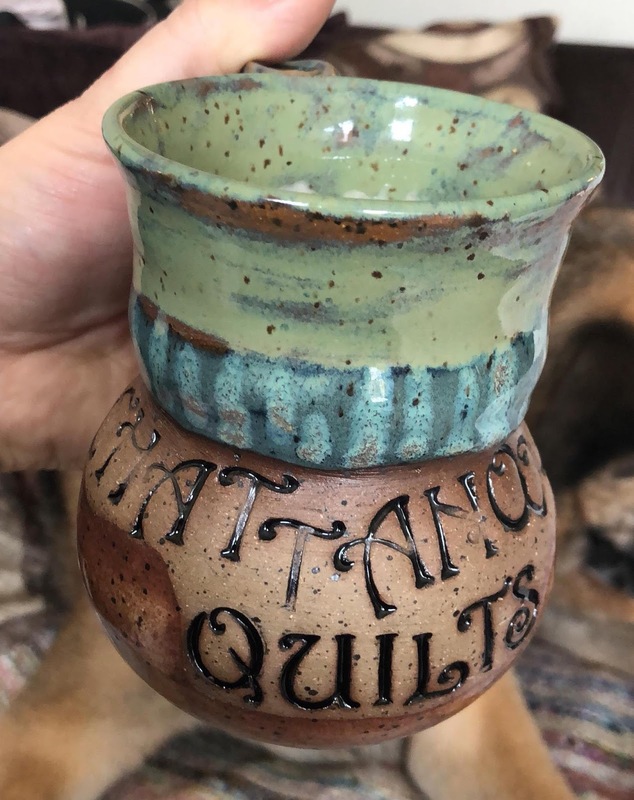 Lana already had several bolts of the "So Darling" line in her shop and it was no surprise that these and the Bumbleberries fashion blender, were leaving with customers in one and two-yard cuts. Fear not! 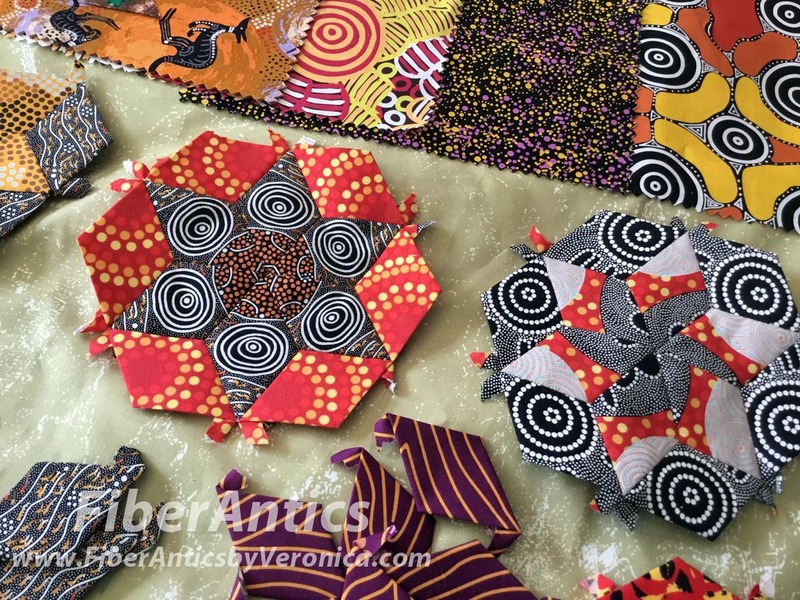 Lana has more Bumbleberries and other upcoming Lewis and Irene collections on order! Ben Taphouse with shop owner,Lana Masengill, at Lana's Quilts and Sew Much More. After hearing the stories behind the company and its fabric designs, I hope the Tennessee and north Georgia quilters and sewers won't be strangers to Lewis and Irene fabric collections that will be making their way to the area's quilt shops. Thank you so much to all the shop owners that allowed us to visit. ... Ben and I did a brain dump and recap of the visits and conversations with shop owners and all the quilters. Believe it or not, Ben recommended Smokey Bones for a great late-evening dish of mac and cheese and deep-fried Oreo cookies (and he claims he does not have a sweet tooth!). One minute it was 9 pm, and the next it was midnight! Time flies when you're talking "fabric." Thanks for a wonderful visit and hope you enjoyed your trip to Chattanooga, Ben! "Enchanted Forest" from Lewis & Irene fabrics. 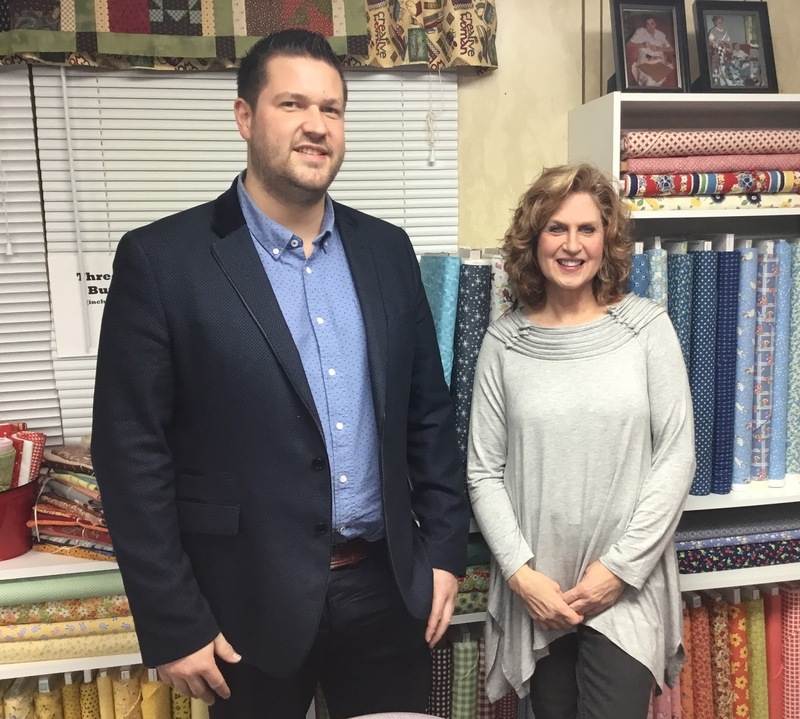 Lewis & Irene is a family-run business that offers quality 100% cotton fabrics. 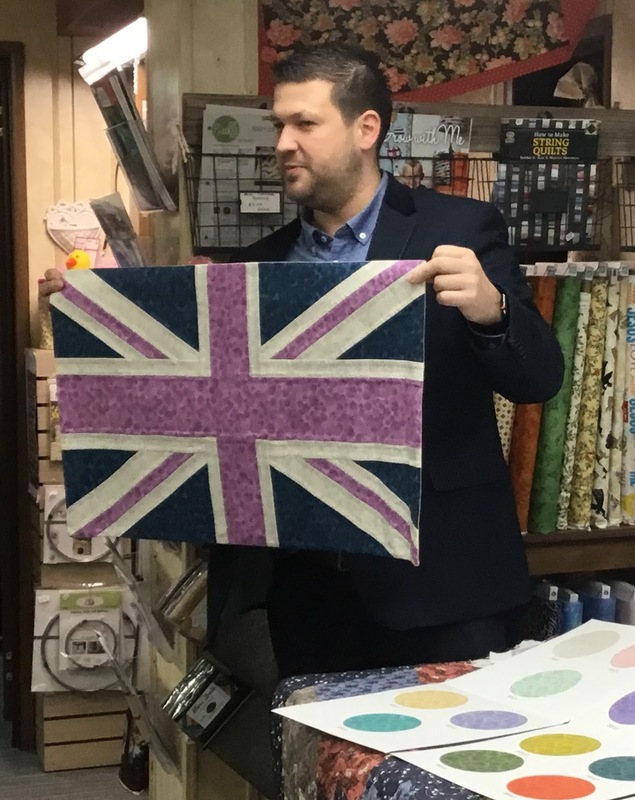 Their unique designs have quickly become "fan favorites" with quilters and sewers in the UK and across Europe. 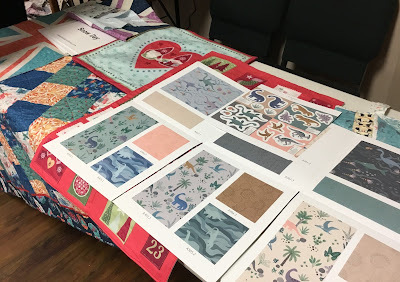 In October 2017, the way was paved to bring these collections to US quilt shops and independent sewing centers so all of us American quiltmakers can get our hands on these lovelies. I hope so, because in about a week, Ben Taphouse, the Director of Sales in the UK for Lewis & Irene, is making a trip to the USA and will be traveling with me in Chattanooga for 2 days. 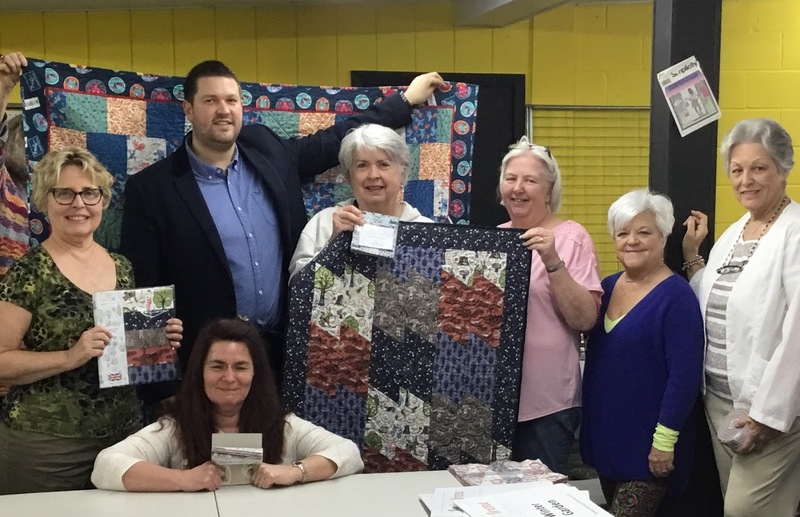 A few Chattanooga area quilt shop owners have graciously made time to meet with Ben and me. And happily, his visit coincides with my quilt guild's monthly meeting, so Ben will be our guest presenter at the Chattanooga Choo Choo Quilters guild meeting. Interested in hearing the Lewis & Irene story? Visiting Chattanooga Quilts and Chattanooga Sewing Machines and More early in the day. 3:00 pm: Meet and Greet at Sew N So Quilt Shop, Rocky Face, GA. 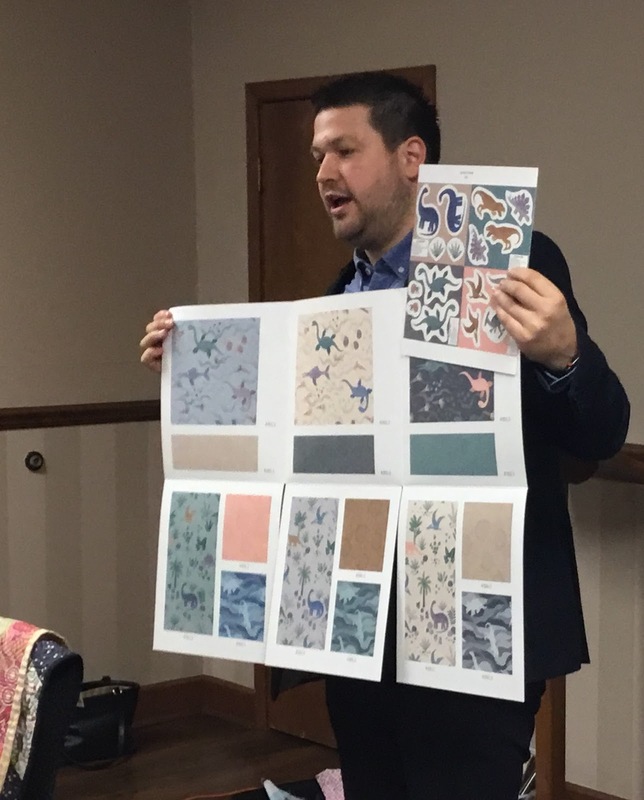 If you live in the Chattanooga area, be on the lookout for Lewis & Irene fabric collections. 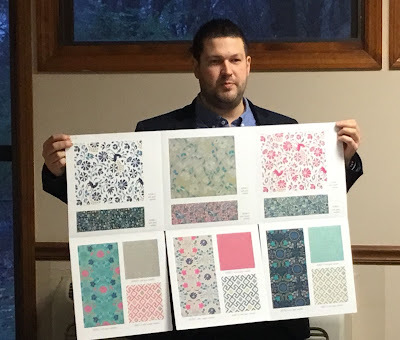 Please support your local quilt shop and ask them to carry these fabrics. You can also email me or let me know if your local quilt shop is interested in this fabric line—I'm happy to contact them. 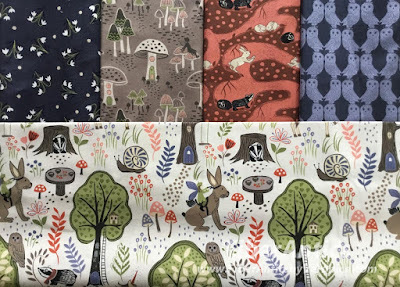 Oh, yeah... and there might be some fabric goodies available for event attendees. The Dreamtime aboriginal designs from M&S Textiles are full of graphic symbols, geometric textures and organic shapes. 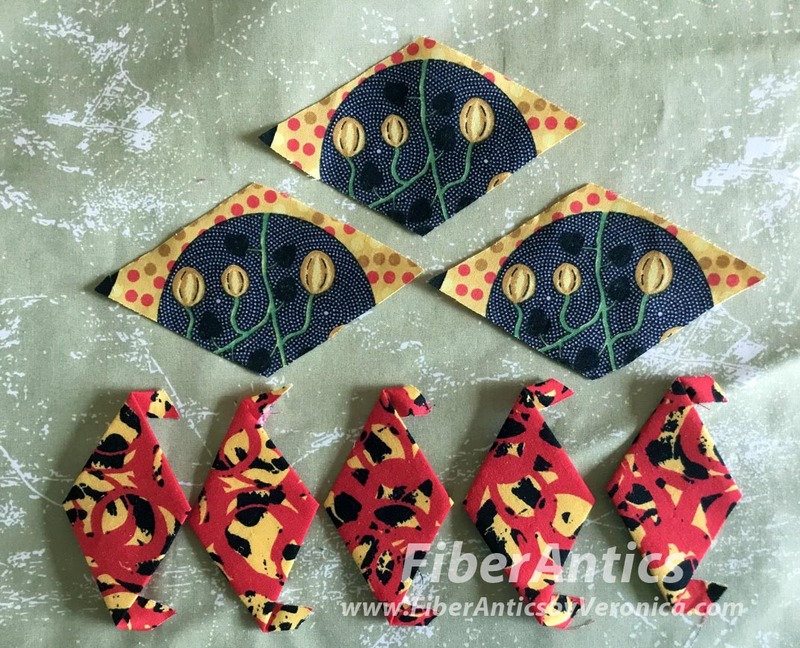 I was recently discussing the possibilities for these Australian fabrics with Jennifer, the owner of Busy Lady Quilt Shop, and she reminded me that they would be ideal for fussy cutting English paper piecing [EPP] shapes. She is so right! 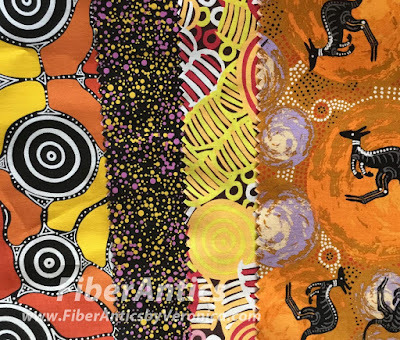 M&S Textiles aboriginal Australian fabric designs. 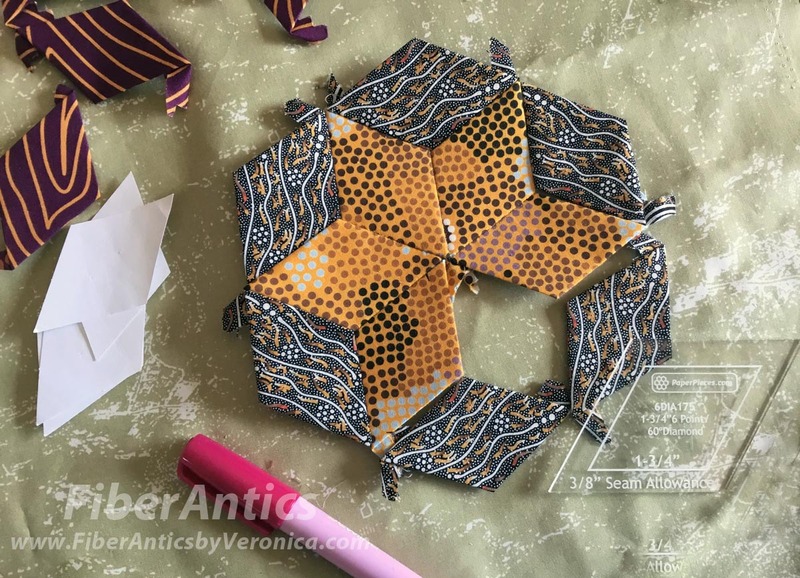 A few years ago, some rep friends and I were on the EPP bandwagon when Paper Pieces launched the Glorious Hexagons stitch-along using Katja Marek’s "The New Hexagon" book. I’m not sure why I didn’t think of the EPP technique for these fabrics sooner... because it's perfect. 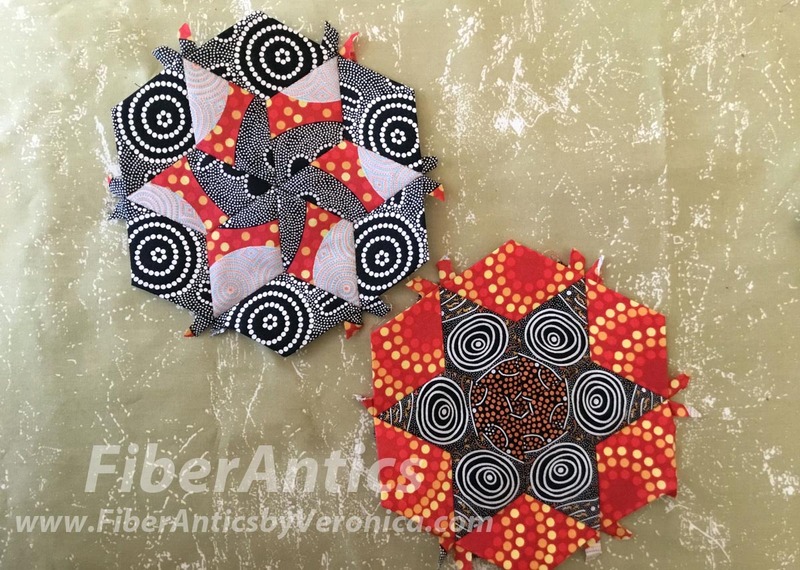 English paper pieced hexagon blocks. 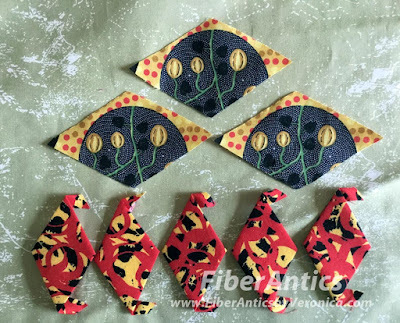 So, I’m rekindling my relationship with this slow stitching technique—English paper piecing—using fabrics with aboriginal designs. The acrylic templates from Paper Pieces make fussy cutting motifs easy and accurate. 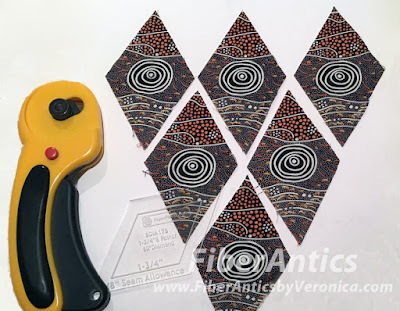 Fussy cutting swirl motifs using an acrylic template and rotary cutter. English paper piecing with aboriginal fabrics from M&S Textiles. The diamond shaped papers I'm using here are 1-3/4 inch card stock papers (also from Paper Pieces.) 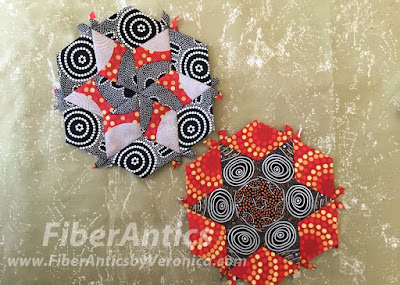 This shape can be combined to make hexagons, stars, the Tumbling Block and other designs. 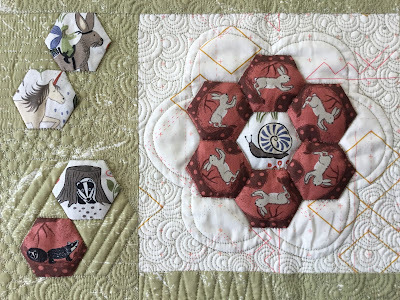 My 8 must-have tools for English paper piecing are detailed in this blog post. Shapes ready for hand piecing. If you need a portable, take-along project, EPP is the answer. Thanks for the insight and reminder, Jennifer! 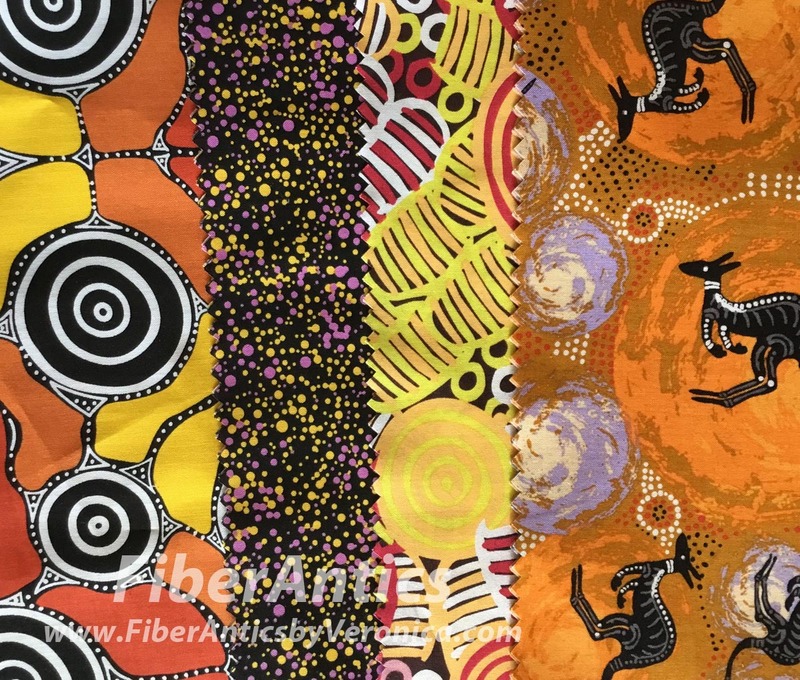 Can't wait to see what you make with the Australian fabrics that are coming to your shop. English paper piecing [EPP] is very portable.